As the story goes, Democrat Senate Majority Leader Harry Reid had promised to adjourn the Senate after passing the CRomnibus and a couple of other bills, leaving these controversial nominees on the table. The Republicans lambasting Senators Lee and Cruz are making the argument that Reid was absolutely, totally going to keep his word and not advance these controversial nominees. As Senator Lee has pointed out this was not only unlikely, but it would be “political malpractice” for a departing Democrat majority leader to fail to cram through every one of his president’s nominees as possible. In Lee's words, "if you think… that [Reid] was going to leave town without confirming everybody that he wanted to confirm in the post-nuclear Senate, they’re crazy." Even the same day that Lee and Cruz put forth their point of order, Reid and the Democrats were reportedly searching for ways to get their nominees through before the end of the session. Were Lee and Cruz really supposed to let Reid’s non-binding promises stop them from exercising their ability to get the Senate on the record against executive overreach? The point that dissenting Republicans are covering up is that their party alone could and should have held up the bloated spending bill on account of its many flaws, but they chose not to. But apparently, they were more concerned with getting home for the holidays without controversy, since 77 Senators, including 28 Republicans, voted to let the bloated Cromnibus through without a contest. In the end, the real story is that a few principled senators exercised their ability to force their colleagues to go on the record supporting a massive presidential breach of Constitutional authority. The fact that their fellow Republicans are upset about this speaks volumes. Would lord obama be surprised if loyal patriotic constitution loving Americans went out in the streets to protest him, holder, sharpton, di blasio & the rest of the traitor rats? Death to tyrants. Molon Labe. With a Leopold & Loeb government, who cares what they say after selling us out? They will surely complain when they are run out into the streets, stripped of their ill-gotten gains -- I cannot see it just ending at that for what they have done. They have declared themselves our enemies and the enemies of all Americans, past present and future; perhaps thinking it is only mere political suicide. The facts speak for themselves when we hear all the rhetoric from republicans on Obama Care, amnesty, IRS, and the list goes on and on. Facts are when it comes to down to it they do nothing. They need to be held accountable for the inaction in upholding the Constitution as all have sworn to uphold and defend. Why are these representatives and senators being re-elected? Not enough patriots that stand for the Constitution and to many politicians that look after their own self-interests. We need to take our Great Country back from these traitors before they destroy all it stands for in its greatness.and freedoms that many have fought and died for to keep. Byron York wrote a column explaining how the establishment is lying about the appointments. Harry Reid had already initiated the actions necessary to bring the appointments to the floor. Who you gonna believe the "Chamber of Commerce " rino's or Byron York? 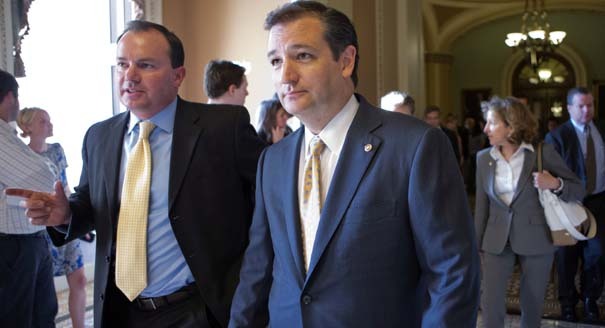 Lee and Cruz would be my pick for a 2016 ticket.